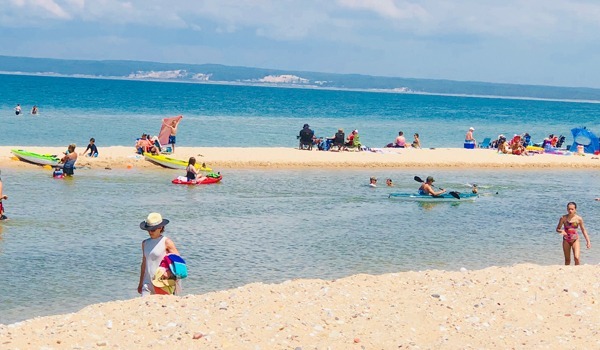 Off to the Platte River to enjoy a leisurely 2-3 hour float down the river ending at one of the most stunning Lake Michigan beaches overlooking the Sleeping Bear Dunes. Hop into a comfortable tube and relax as the river slowly scrolls you through some beautiful Michigan scenery. Yes…adult beverages are allowed and go well with tubing so we will provide coolers that will float right down the river with you. 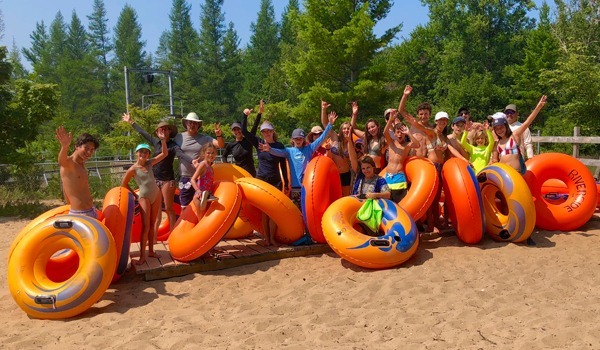 End your float where Lake Michigan and the river meet at Platte Point where you’ll experience stunning views of the Sleeping Bear Dunes, a beautiful beach and a sandbar outlet to Lake Michigan where warm river water and cooler lake Michigan waters unite. After a fun day of floating the river you will be served a picnic lunch at the park and will have time to play in the sun and sand before we head back to TC. This is a turnkey full day getaway with transportation, a canvas bottom tube, life jackets if requested, lunch and Bay Life Getaways swag all included in your adventure. Sit back, relax and enjoy a relaxing day of fun, sun, sand and adventure.